(CNN) -- U.S. President Obama sent a direct message to Iran's Supreme Leader Ayatollah Ali Khamenei weeks before this month's disputed election, Iranian sources said Wednesday. Iran's supreme leader, Ayatollah Ali Khamenei, calls for an end to protests last week at Tehran University. The letter requested dialogue and engagement between the two nations, the sources said. The sources said that Khamenei has yet to reply to the letter but that nonetheless it "had set the negotiating table in order for both sides to sit around it after the election." The White House refused to "get into the specifics of our different ways of communicating," a senior Obama administration official said. "We have indicated a willingness to talk for a long time and have sought to communicate with the Iranians in a variety of ways," the official said. 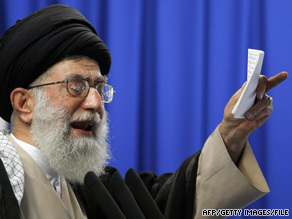 Khamenei made an indirect reference to the letter in his sermon on Friday at Tehran University. "The U.S. president said that we were waiting for a day like this to see people on the street," the Iranian leader said. "Some people attributed these remarks to Obama, and then they write letters to say we're ready to have ties, that we respect the Islamic Republic, and on the other hand, they make such comments. Which one should we believe?" One Iranian source said, "We thought President Obama would send congratulations to President Ahmadinejad," and before the election, his senior advisers prepared a response to the anticipated note, which never came. "The longer it is delayed," the source said, "the less likely [U.S.-Iranian talks] will happen." Another Iranian government official said there is still "no trust" between Iran and the United States. The source said he is waiting for "real change" even though the Iranian government welcomed the change in tone of the Obama administration before the current election turmoil in Iran. The official went on to cite a recent gesture by Iran toward Obama: the release of journalist Roxana Saberi. The official said Iran accepted Obama's assurances that she was not a spy and had allowed the Iranian citizen to leave the country. Since, under intense scrutiny amid growing concerns over Tehran's violent crackdown on street protests, Obama has sharpened his language on Iran. "The United States and the international community have been appalled and outraged by the threats, beatings and imprisonments of the last few days," Obama said Tuesday, adding that he strongly condemns "these unjust actions." He has not spoken in support of Ahmadinejad or his main rival, Mir Hossein Moussavi, whose supporters have taken to the streets to protest the results of the June 12 election that gave Ahmadinejad a second term. Obama's letter to Khamenei is in keeping with his publicly stated aim of engagement with Iran and his New Year's message in which he described a new way forward. The Obama administration has "made it clear that any real dialogue -- multilateral or bilateral -- needed to be authoritative," according to the senior administration official. The official noted that the Iranians have yet to respond to a diplomatic outreach made during talks on Iran's nuclear program April 8. At that time, the administration asked the European Union's international policy chief, Javier Solana, to invite Iran to new talks with the permanent members of the U.N. Security Council and Germany. But the administration's tack toward Iran may be changing, as senior officials in Washington said the Obama administration is seriously considering not extending further invitations to Iranian diplomats for July 4 celebrations overseas. Some invitations had been sent and will not be rescinded, senior administration officials said. The Obama administration had decided to invite Iranians to the celebrations at overseas posts as part of Obama's policy of engaging the Iranian regime. As part of that engagement, Obama videotaped a message for the Iranian people on the Persian new year, and U.S. officials have engaged members of the Iranian government. CNN's Elise Labott and Dan Lothian contributed to this report.